1. Miyawaki T, Kohjitani A, Maeda S, Higuchi H, Arai Y, Tomoyasu Y, Shimada M. Combination of midazolam and a cyclooxygenase-2 inhibitor inhibits lipopolysaccharide-induced interleukin-6 production in human peripheral blood mononuclear cells. Immunopharmacology and immunotoxicology (2012) 34: 79-83. 3. Miyawaki T, Kohjitani A, Maeda S, Higuchi H, Shimada M. Effects of isoflurane-induced and prostaglandin E1-induced hypotension on cytokine responses to oral and maxillofacial surgery. Journal of Clinical Anesthesia (2004) 16:168-72. 4. Miyawaki T, Sogawa N, Maeda S, Kohjitani A, Shimada M. Effect of midazolam on interleukin-6 mRNA expression in human peripheral blood mononuclear cells in the absence of lipopolysaccharide. Cytokine (2001) 15:320-7. 5. Miyawaki T, Maeda S, Koyama Y, Fukuoka R, Shimada M. Elevation of plasma interleukin-6 level is involved in postoperative fever following major oral and maxillofacial surgery. Oral Surgery Oral Medicine Oral Pathology Oral Radiology and Endodontics (1998) 85:146-52. 6. Miyawaki T, Maeda S, Shimada M. Elevation of plasma interleukin-6 level in patients undergoing oral and maxillofacial surgery. Oral Surgery Oral Medicine Oral Pathology Oral Radiology and Endodontics (1996) 81:15-20. 7. Miyawaki T, Yao H, Koyama E, Maeda S. Prevention of postanesthetic shivering with intravenous administration of aspirin. Journal of Anesthesia (1991) 5:123-7. 3. Maeda S, Higuchi H, Watanabe Y, Hayashi Y, Yoshida K, Kohjitani A, Egusa M, Miyawaki T, Shimada M. Clinical experience of general anesthesia using laryngeal mask airway for ambulatory dental treatment on patient with intellectual disability. 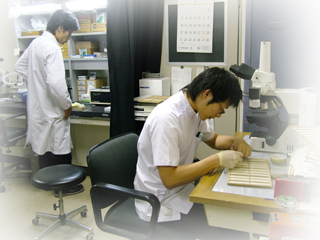 The 11th International Dental Congress on Modern Pain Control, 2006, Yokohama, Japan. 5. 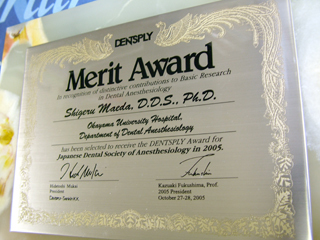 Miyawaki T, Kohjitani A, Maeda S, Egusa M, Mori T, Higuchi H, Kita F, Shimada M: Intravenous sedation for dental patients with intellectual disability. J Intellect Disabil Res 48: 764-768, 2004. 6. Miyawaki T, Kohjitani A, Maeda S, Kita F, Higuchi H, Shimada M: Serum cortisol level and depth of propofol-induced sedation. Acta Anaesthesiol Scand 48: 384-385, 2004. 7. 北ふみ，前田　茂，江草正彦，森　貴幸，宮脇卓也，嶋田昌彦：知的障害者歯科治療時の静脈内鎮静法におけるBispectral Index（BIS値）と覚醒時間との関係．障害者歯科, 24: 540-544, 2003. 8. 北　ふみ，宮脇卓也，前田　茂，嶋田昌彦：静脈内鎮静法におけるプロポフォールの投与方法の検討．岡山歯学会雑誌, 21: 195-200, 2002. 9. 宮脇卓也, 前田　茂, 江草正彦, 森　貴幸, 梶原京子, 北　ふみ, 糀谷　淳, 嶋田昌彦: 知的障害者歯科治療においてミダゾラムとプロポフォールを併用して頻回に行った静脈内鎮静法症例の検討. 障害者歯科23(2): 99-104, 2002. 10. 前田　茂, 梶原京子, 森貴幸, 江草正彦, 宮脇卓也, 嶋田昌彦: 静脈内鎮静法下で歯科治療を行ったアルツハイマー病の1症例．障害者歯科 21(1): 60-63, 2000. 11. Maeda S, Miyawaki T, Shimada M: The effects of intravonous sedation of propofol for dental treatment of handicapped patients-difference of effects of sedation on each site and each dental treatment-. JJSDH, 19 Suppl, 303, 1998. 12. 前田　茂, 宮脇卓也, 江草正彦, 森貴幸, 嶋田昌彦: 障害者歯科治療における静脈内鎮静法について　プロポフォールとミダゾラムの併用とミダゾラム単独投与との比較. 原著論文. 障害者歯科 19(2): 170-176, 1998. 13. 前田　茂、宮脇卓也、嶋田昌彦: ミダゾラムに対するフルマゼニルの拮抗作用 第２報　深い鎮静状態における拮抗作用. 日本歯科麻酔学会雑誌 23(1): 111-118, 1995. 14. 前田　茂，宮脇卓也，嶋田昌彦: ミダゾラムの静注による鎮静，平衡機能に対するフルマゼニルの拮抗作用. 日本歯科麻酔学会雑誌 22(3): 455-465, 1994. 1. Tatsushi Yoshitomi, Atsushi Kohjitani, Shigeru Maeda, Hitoshi Higuchi, Masahiko Shimada, Takuya Miyawaki: Dexmedetomidine enhances the local anesthetic action of lidocaine via an alpha-2A adrenoceptor. Anesth Analg 107: 96-101, 2008. 4. 友安弓子　経口用ミダゾラム封入リポソームの開発. 岡山歯学会雑誌, 29: 1-10, 2010. 1. 前田　茂，江草正彦，森田　学，武田則昭：知的障害者の二次的障害としての咀嚼障害の原因と対策について．厚生科学研究費補助金障害保険福祉総合研究事業　平成17年度総括研究報告書．2006. 3. 前田　茂，江草正彦，森田　学，武田則昭：知的障害者の二次的障害としての咀嚼障害の原因と対策について．厚生科学研究費補助金障害保険福祉総合研究事業　平成16年度総括研究報告書．2005. 4. 前田　茂，宮脇卓也，江草正彦，武田則昭，森　貴幸：知的障害者の歯科治療におけるノーマライゼーションに関する研究．厚生科学研究費補助金障害保険福祉総合研究事業　平成14年度総括研究報告書．2003. 5. 前田　茂，宮脇卓也，江草正彦，武田則昭，森　貴幸：知的障害者の歯科治療におけるノーマライゼーションに関する研究．厚生科学研究費補助金障害保険福祉総合研究事業　平成13年度総括研究報告書．2002. 1. Arai Y, Maeda S, Higuchi H, Tomoyasu Y, Shimada M, Miyawaki T. Effects of midazolam and phenobarbital on brain oxidative reactions induced by pentylenetetrazole in a convulsion model. Immunopharmacology and immunotoxicology 34(2): 216-221, 2012. 2. Maeda S, Arai Y, Higuchi H, Tomoyasu Y, Mizuno R, Takahashi T, Miyawaki T. Induction of apoptotic change in the rat hippocampus caused by ferric nitrilotriacetate. Redox Rep 16(3): 114-120, 2011. 3. Nakatsuka I, Maeda S, Andoh T, Hayashi T, Mizuno R, Higuchi H, Miyawaki T: Oxidative changes in the rat brain by intraperitoneal injection of ferric nitrilotriacetate. Redox Rep 14: 109-114, 2009. 4. Maeda S, Miyawaki T, Higuchi T, Shimada M: Effect of flumazenil on disturbance of equilibrium function induced by midazolam. Anesth Prog 55: 73-77, 2008. 5. Maeda S, Nakatsuka I, Andoh T, Yamaai Y, Higuchi H, Miyawaki T, Shimada M. Brain Reactions to oxidative stress caused by intraperitoneal injeciton of ferric nitrirotriacetate (Fe-NTA) in rats. 36th annual meeting, Neuroscience 2006, Atlanta, October 14-18, 2006. 6. Maeda S, Nakatsuka I, Yamaai Y, Higuchi H, Miyawaki T, Shimada M. Induction of heme oxygenase-1 mRNA in brain by intraperitoneal injection of ferric-nitrilotriacetate (Fe-NTA) in rat. 35th annual meeting, Neuroscience 2005, Washington DC, November 12-16, 2005.